The GOP should rally around Ted Cruz to stop Trump. 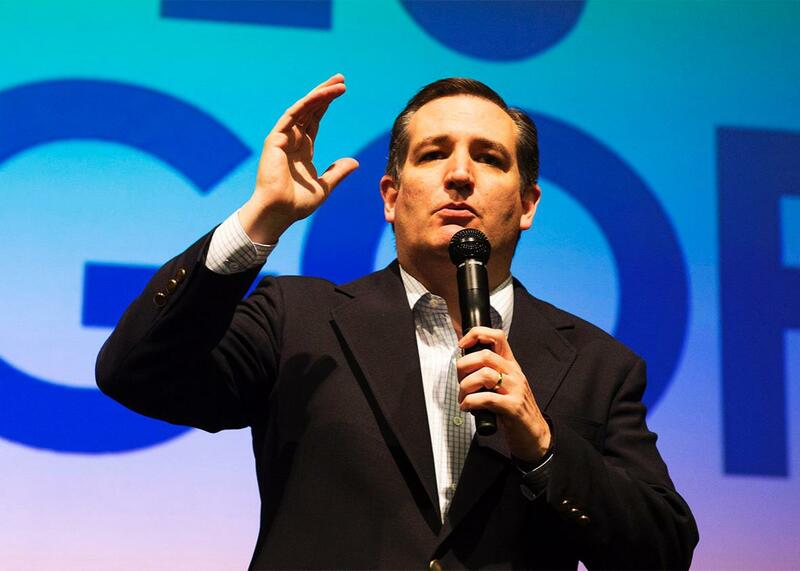 The party should rally around Ted Cruz if it wants to save itself from Donald Trump. One of the many problems with the Republican establishment’s current “everyone stay in” strategy of blocking Donald Trump’s presidential nomination is a limit of imagination. It envisions preventing Trump from reaching the 1,237 delegates needed to secure the nomination on the first convention ballot. It doesn’t consider, however, what it would mean to try to deny Trump the nomination if he still has a significant delegate lead heading into the convention. Mitt Romney, the most notable supporter of this strategy, explained how it works in his anti-Trump speech last week. “Given the current delegate-selection process,” Romney said, “this means that I would vote for Marco Rubio in Florida, for John Kasich in Ohio, and for Ted Cruz or whichever one of the other two contenders has the best chance of beating Mr. Trump in a given state.” All three candidates stay in, then, and divvy up the work of defeating Trump depending on who is nearest to him in any particular contest. As Romney said, the big test for this strategy will be the winner-take-all contests in Ohio and Florida on March 15. But even if Rubio and Kasich can topple Trump in their respective home states and deny him those delicious 165 winner-take-all delegates, Trump will still be far ahead of both Kasich and Rubio. And Ted Cruz, the only candidate who’s close to Trump in the current delegate count, won’t gain any ground. The “everyone stays in” strategy, as elucidated by Romney and other anti-Trump leaders, might be a viable theory for stopping Trump’s march to 1,237. But even if it gets from A to B, it offers no clear insight into getting from B to C: wresting the nomination from the delegate leader heading into the convention without spurring an uprising or a third-party bid. The party’s real goal shouldn’t just be to stop Trump from hitting 1,237. It should be for one of the remaining candidates to seize the delegate lead from him before they head into the convention, since the only fair outcome of a contested convention—one that each faction can swallow as equitably determined—is one in which the leader heading into Cleveland comes away with the nomination. The anti-Trumpers’ goal, then, should be to ensure that Cruz is the delegate leader heading into the convention. Cruz is the only candidate close to Trump in terms of delegates and states won. Trump has won 12 states and 384 delegates to Cruz’s six and 300. And the movement among anti-Trump voters appears headed in Cruz’s direction. Even though Saturday night’s four contests (Louisiana, Kansas, Maine, Kentucky) posed more of a challenge to Trump than expected, Trump’s support itself did not collapse. As the New York Times’ Nate Cohn shows, Trump more or less hit his projected percentages in those states. The contests were only close because Cruz drank Rubio’s milkshake. Cruz’s surprise win in Maine—even if it was “just a caucus”—indicates, too, that his brand of evangelical Tea Party conservatism may have a better chance of breaking out of the South than previously imagined. It will be important to see if Rubio’s voters continue to migrate towards Cruz in Tuesday’s contest in Michigan, a mostly blue Midwestern state. One Michigan poll released on Monday, from Monmouth, shows Cruz surging into second place with Rubio in a dismal fourth. If Rubio loses Florida, where he was already trailing and where a national Cruz surge may well deliver the final dagger, the GOP establishment will have little justification for trying to make Marcomentum happen anymore. Rubio already trails Trump by about 230 delegates; losing his home state would instantly jump whatever his margin is after this week’s contests by 99 delegates. If Trump can put away Ohio, Rubio’s deficit balloons by another 66 delegates. And if Trump wins Florida and Kasich wins Ohio, Rubio will be left fighting for the bronze medal with Kasich while Cruz and Trump hash it out at the big boys’ table. If Rubio is finished after Florida, it’s hard to say whether it would help Cruz more to keep Rubio in the race to some undetermined date or have him drop out. The point is that whatever action Rubio and the party establishment take would need to be done in the service of Cruz if the goal really is to prevent Trump from winning the nomination. But would the establishment even prefer Cruz to Trump? Cruz’s Senate colleagues hate him, and with justification. Cruz’s three-year, cynical strategy as a senator has been to use his colleagues as a foil against which to build his anti-Washington brand. But the purported thinking in January that the GOP establishment would somehow prefer Trump to Cruz was the product of a different, pre-voting time in which the establishment believed it had more options. There was more leeway to get cutesy with scenarios that would eliminate both Cruz and Trump by feigning to prefer the latter: by arguing that, say, it would have been wise to knock out Cruz in Iowa so as to pave the way for an establishment candidate to defeat Trump one-on-one. Cruz exists on a recognizable political spectrum. But that doesn’t even get to the root of it. More importantly to people like Romney and Graham is that Cruz is competent and capable of serving as president without ending the world. Responsible people, no matter their policy differences, can envision Cruz getting through any given day in the White House with the world still intact. With Trump, you can never be quite sure that he won’t initiate a nuclear holocaust because, say, the president of China made a passing joke about his hair. Cruz might be too far to the right to win a general election, but Trump is unstable, embarrassing, and frightening. The worst case scenario for Republicans with a Cruz nomination is a defeat with dignity that at least gives movement conservatives their man; the worst case scenario for Republicans with a Trump nomination is either a humiliating loss or a frightening win that invites the apocalypse. Cruz is looking more and more like the only vehicle available for stopping Trump. The party should do what it can to give him the delegate lead heading into the convention.